I was delighted (if a little behind the times) to discover recently that David Austin, owner of the fantastic Reuben’s Cafe and Wine Store has launched a brand new Dunfermline venture – The Bruery – Microbrewery & Bar. I have been saying for ages that this man should open up a bar/restaurant and I am so glad that he finally has. Although I like a drink (well don’t we all!) I am no aficionado and so I was more interested in the food when I visited with B last Saturday evening. I was soon to discover however that the ale is impossible to ignore at the Bruery – and quite rightly so. NOTE : Beautiful soft candlelight meant that I got very few good shots as I tend not to use the flash (a bit off-putting for other diners) and don’t have a lovely posh camera that could overcome such paltry obstacles. The Bruery is located in a beautiful old town house in the centre of Dunfermline and I was delighted that the interior ticked all the right boxes for me: heaps of original features, quirky contemporary touches, restored wooden floors, soft lighting and lots of candles. 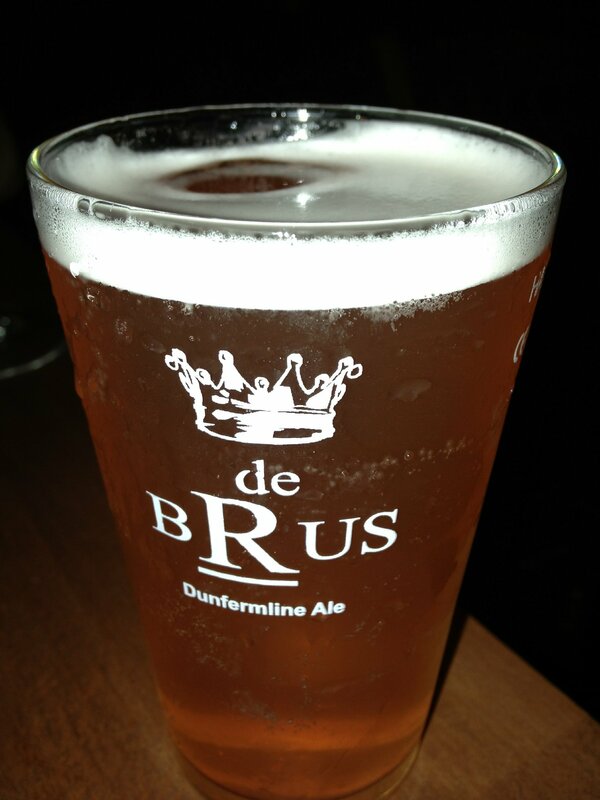 The menu is very simple and rather clever with dishes created to compliment and often include the de BRUS ales. There are sharing platters, small plates, mains and a range of flat breads with a tasty variety of toppings. I kicked off the evening with a Raspberry Cider whilst we were trying to make up our minds and very nice it was too. Definitely something I will be ordering again. We finally opted to share Deep Fried Whitebait with Aioli and some bread, oil and balsamic to start. 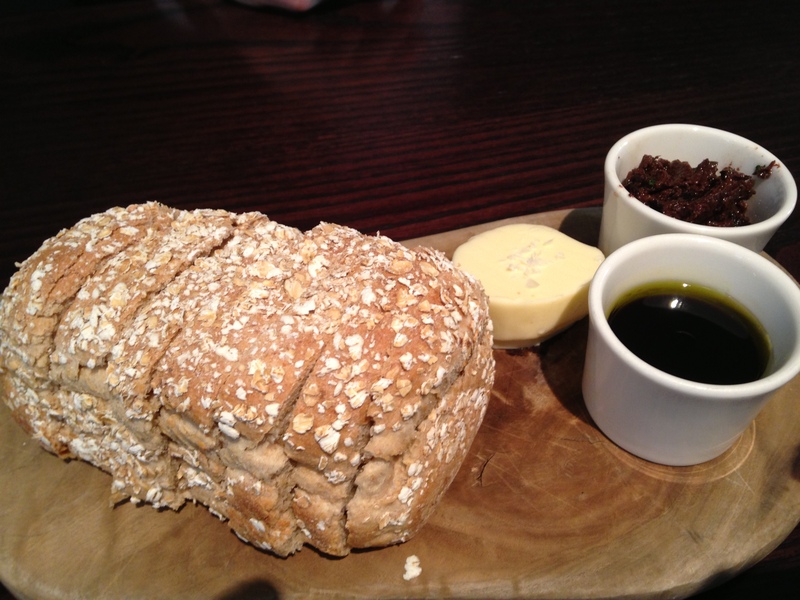 The bread was thin and warm with a wonderful little crisp to it – delicious for dipping. 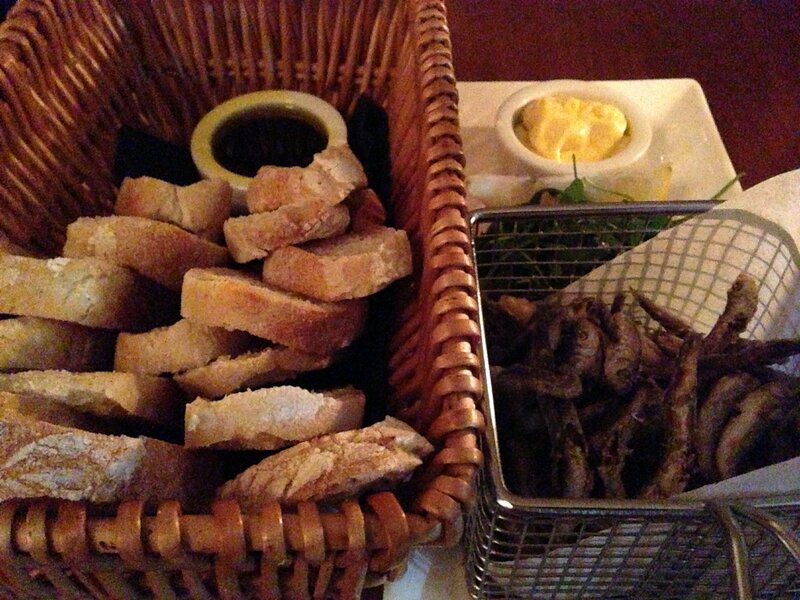 I love good presentation and the arrival of the whitebait in a mini frying basket delighted me. Apart from looking fantastic I can report that these little critters went down a treat. Alioli is just the best thing to go with whitebait but it was just as well we were both eating it otherwise the chances of a snog at the end of the date would have been slim! 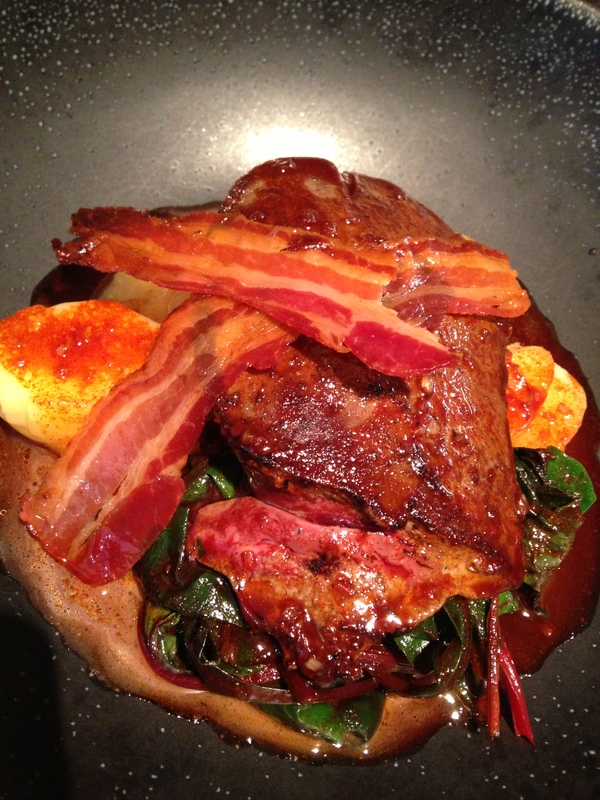 Most of the main courses have an underlying ale theme. I chose the De BRUS Nut Brown Ale Stew with Mash and Veg and B opted for the Blond Ale Battered Fish with Pea Puree and Chips. The stew was beautifully simple and most importantly cooked to perfection. 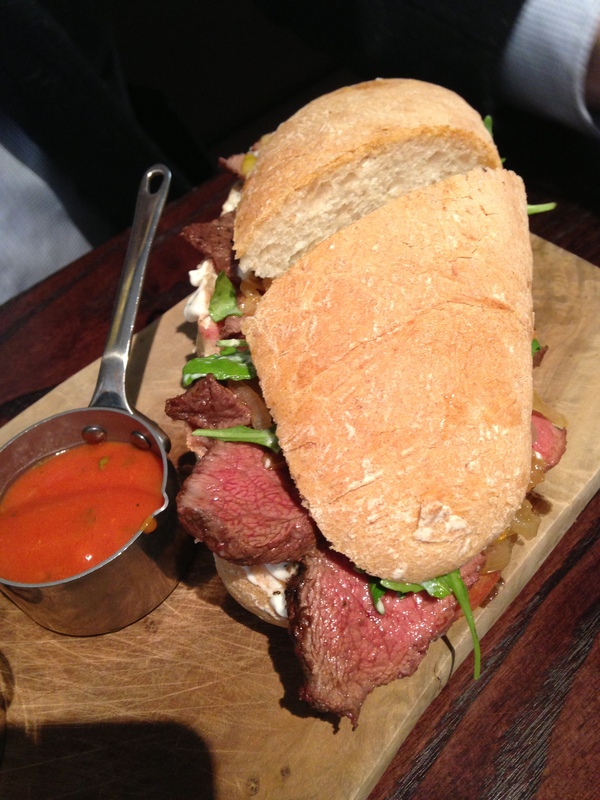 The taste of the ale really shone through the ever so tender meat, it really was sublime. Tatties and veg may seem basic, but often it is the simplest things that ruin a meal. Not so here, luxurious creamy mash made this real treat. Muttering of a wholly positive nature came from the husband camp as he chowed down on beautifully presented fish and chips. The batter was crisp and the fish was soft, flaky and moist and the chips were huge (in a very very good way). It is safe to say I was pretty impressed. I finished our meal with possibly the largest slice of Ginger Cheesecake I have ever seen, served with a beautifully delicate ginger sorbet whilst B opted for his old favourite – Crème Brulee. Thankfully The Bruery know how to make a creme brulee so there was no need to relive Brulee Gate 2010. 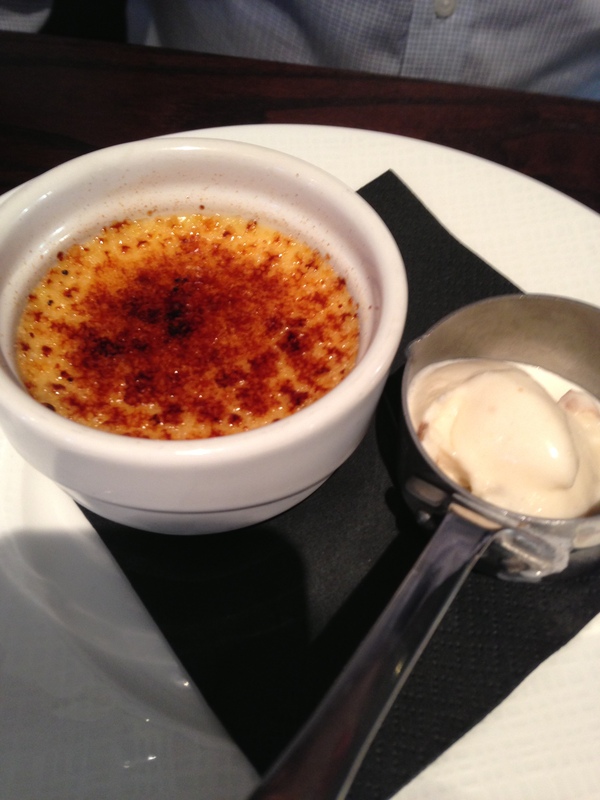 Brulee Gate is another story for another day involving another Dunfermline restaurant. We had such a fabulous evening at The Bruery. 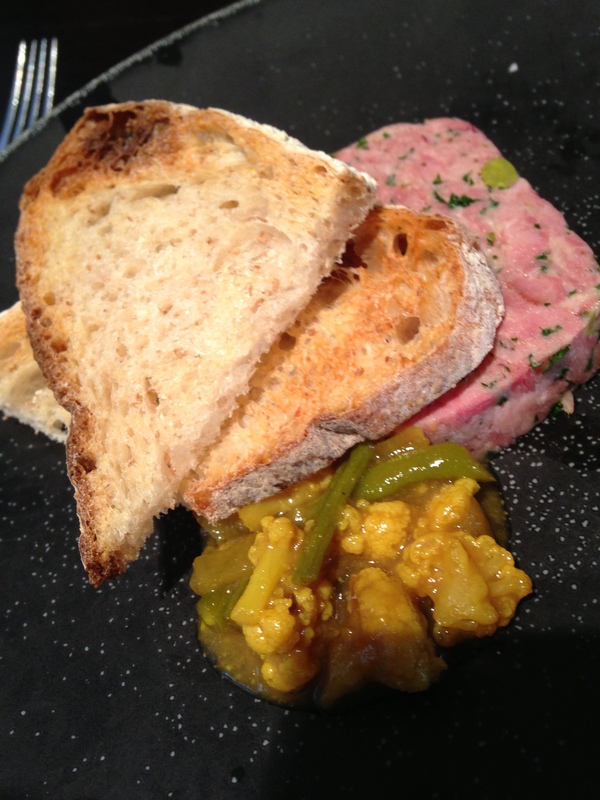 It has a lovely atmosphere, the interior was perfect, the staff attentive and best of all the food was cracking! Well done Mr Austin and all of your team. It seems you have done it again. Care to go for a hat trick? Categories: Uncategorized | Tags: BRUS, David Austin, Dunfermline, Nut Brown Ale, The Bruery | Permalink.